It was a far cry from confabs just harping on how media disseminate hate speech, promote sedition, spread rumors, and are used for nefarious purposes. 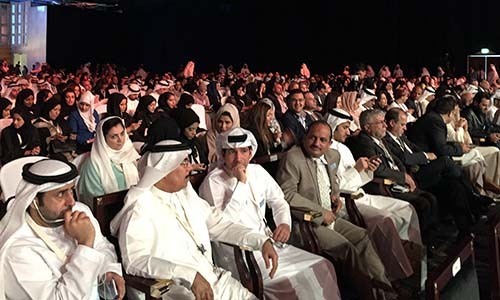 The Arab Media Forum (#AMF2016) this week in Dubai - a major annual attraction - focused on how media in general, and social media in particular, can be channeled to spread peace and humanitarian principles, and how to make happiness an achievable target. 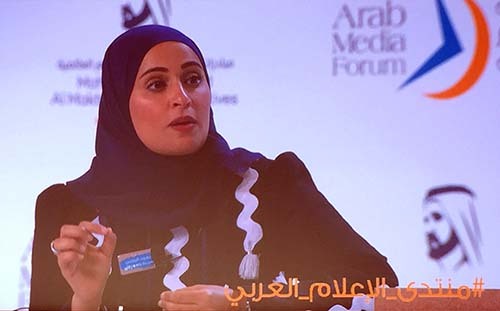 "Our region desperately needs to spread positive thinking that stimulates the feeling of happiness, given the proliferation of conflicts and challenges that have taken root, and given the spread of strange values like fanaticism and intolerance in our societies," said the United Arab Emirates (UAE) Minister of State for Happiness Ohood Al Roumi. The young cabinet member added that a 2015 World Happiness Report showed under-18 youth in the Arab World felt more stressed and worried than their counterparts in other regions. 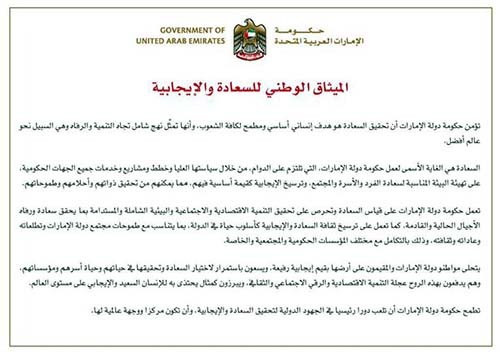 Screen shot of UAE's "National Covenant for Happiness & Positivity"
The UAE launched a government entity grouping 90,000 federal employees with a budget of about $13.2 billion to ensure sustainable happiness in the country for citizens and foreign residents alike. It also disseminated a "National Covenant for Happiness and Positivity" via Twitter that is expected to help growth of the country's GDP. 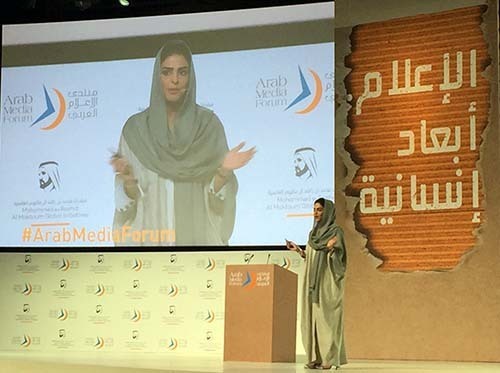 Dubbed "Media for Good," the two-day forum drew more than 2,000 participants from across the Middle East/North Africa region and beyond, including media professionals, academics, government officials, and students. "Give media workers their material rights to ensure dignified subsistence," said Princess Haya Bint Al Hussein, the U.N.'s Messenger of Peace, in a keynote address. "Lift curbs on the Fourth Estate so that journalists can do their jobs of conveying the true picture of the region, provided they abide by standards and laws, because nobody is above the law." 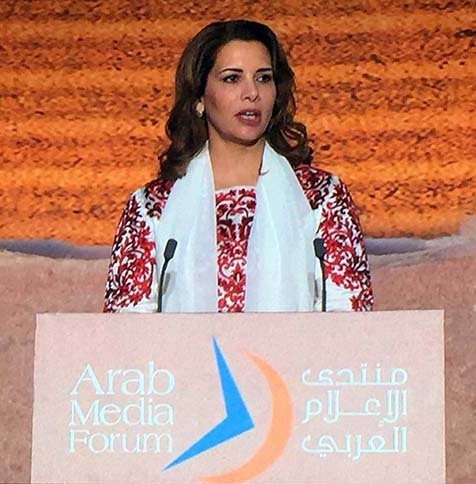 The princess, who is the daughter of Jordan's late King Hussein, sister of the current monarch Abdallah, and wife of Dubai's ruler Sheikh Mohammad bin Rashid Al Maktoum, noted that political, economic and social upheavals in the Arab World had led to the marginalization of humanitarian issues, that, in turn, left media with negative priorities. Among them is the tarnished image of Islam, distorted by wayward adherents and terrorists, playing out in the media, notably in the West, according to Princess Ameerah Al Tawil. The princess, wife of Saudi entrepreneur Prince Alwaleed Bin Talal, called on true Muslims to counter the xenophobia and social media hate campaigns. She referred to a Google search she conducted for the word "Islam" that initially yielded results associated with terrorism. 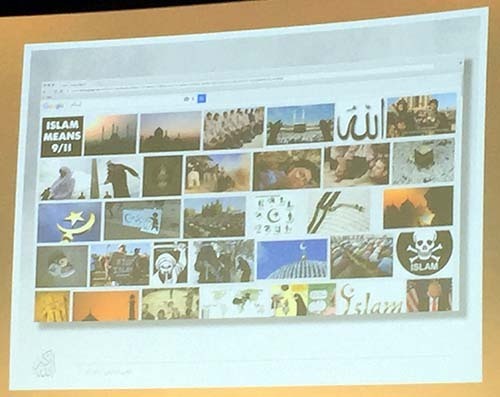 In a session moderated by CNN International anchor/correspondent Hala Gorani, the UAE's Ambassador to Russia Omar Saif Ghobash said some 80 percent of media messages produced by ISIS were in Arabic, while 12 percent were in Russian. "There is a tremendous opportunity to work with Russia in combating extremism in the region," he said in a session entitled "Spreading Peace and Humanitarian Principles." Insulting Russia in Western media is counter-productive, he added. 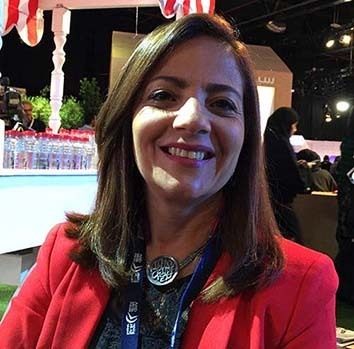 "While some call for a media code of ethics, a decrease in broadcasts of decapitation scenes, or a ban on 'how-to-make-a-bomb' instructions, terrorism continues to test the humanity of screens," wrote Egyptian journalist Amina Khairy in the pan-Arab daily Al Hayat. 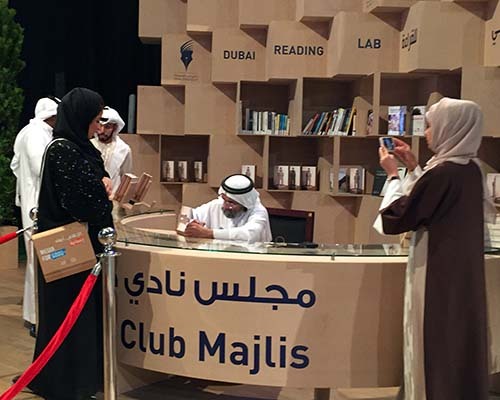 The Arab Social Media Network, a Dubai Press Club enterprise, organized an informal "Discussion of the Influentials" session during the forum aimed at eliciting ideas to promote a positive outlook in young people who make up the majority of social media users in the region. 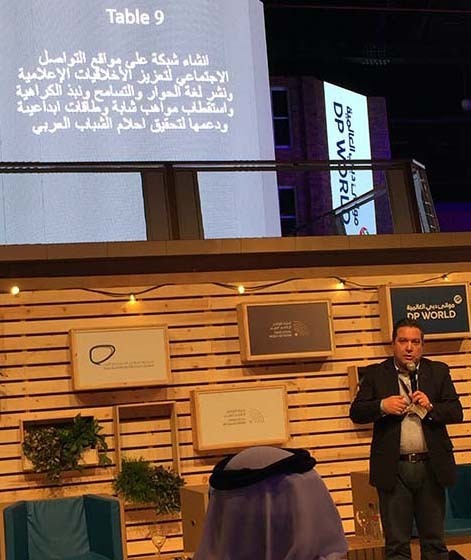 One group of "influentials" at the gathering proposed "establishing a social media network to reinforce media ethics, spread the language of dialogue and forgiveness, reject hate, and attract and support young talents and innovative spirits to fulfill Arab youths' dreams." 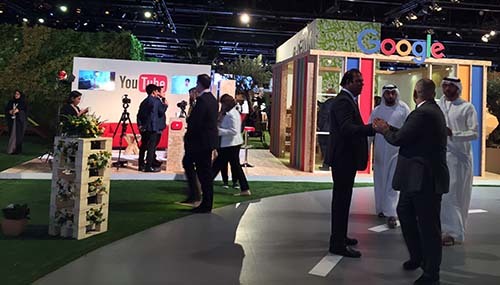 Side activities at the forum included workshops by Bloomberg, Sky News Arabia, Google, YouTube and Facebook, as well as book signings and mini sessions dubbed "14 Minutes for Good." Speakers also tackled the issue of media's coverage of the Middle East, the impact of digital on journalism practices, and U.S.-Arab diplomacy. 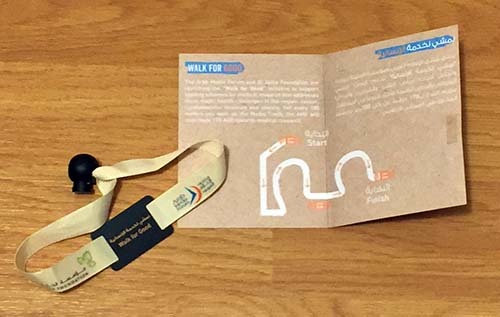 The Arab Media Forum and Al Jalila Foundation launched the "Walk for Good" initiative to support funding schemes for medical research on cancer, cardiovascular diseases and obesity - three major health challenges in the region. Forum participants got wristbands with tags that could be scanned at various stops along the "Media Track" at the event. For every 100 meters (109.4 yards) they walked, the AMF contributed 170 dirhams ($46.28) towards medical research.